Do you have a TV with only an RF input jack? These TV sets have only one way to get a signal in and you can only use a coaxial cable, not RCA cables. Because of this limitation, you cannot connect modern components directly to the TV set if they use only RCA type outputs such as a DVD player or HD satellite receiver. You must use another device which converts the RCA style cable connections into a coaxial type connection and modulates the signals to channel 3 or 4 on the VHF tuner in the older TV set. This is what the RF modulator does. It converts the RCA type connection (yellow video and white and red audio) to a coaxial cable connection and outputs to channel 3 or 4 so the older TV can tune in to the video and audio. There are RF modulators with only one set of RCA inputs such as the Recoton DVD647 RF Modulator. Then there are video switchers with a RF modulator. These devices have the capability to switch between multiple input components and output to channel 3 or 4 via the modulator. These devices are called audio/video switchboxes with a RF modulator. Then there are switch boxes without an RF modulator. These boxes only switch RCA type A/V cables and do not modulate to a RF output. Be careful to get the correct kind of box for your needs. The A/V switcher above has three RCA type inputs and one RCA output along with a coaxial input for TV antenna/cable box and a coaxial RF output to the TV set. These boxes allow you to hookup multiple RCA style components such as DVD player, satellite receiver, video game etc. and output to the older TV set on channel 3 or 4. Selector buttons on the front allow you to select which component to use. An additional RCA input on the front panel allows a camcorder hookup so you can play videos on your older TV set. 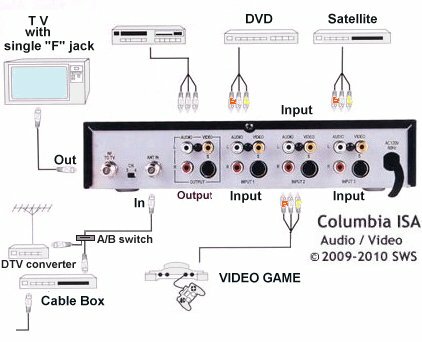 • Connects DVD players, video game systems, camcorders and other video components to TV with a single RF input jack. • Ideal for TVs not equipped with an RCA style Audio/Video jack. • Also has RF input for connecting cable TV or antenna signal. Connection: You will need one A/V cable with RCA style jacks and two 75 Ohm coaxial cables with F-type connectors to connect it between a video input source and your TV set. 1. Connect a pair of RCA-style cables from the “Audio out” jacks on your A/V equipment (DVD, video game, satellite receiver) to the “Audio In” jacks of the RF modulator. Usually white and red RCA cables. 2. Connect an RCA-style cable from the “Video out” jack on your A/V equipment (DVD, video game, satellite receiver) to the “Video In” jack of the RF modulator. Usually yellow RCA cable. 3. Connect the coaxial cable with your VHF signal (TV antenna/cable) to the 75 Ohm coaxial “ANT IN” input on the RF modulator. 4. 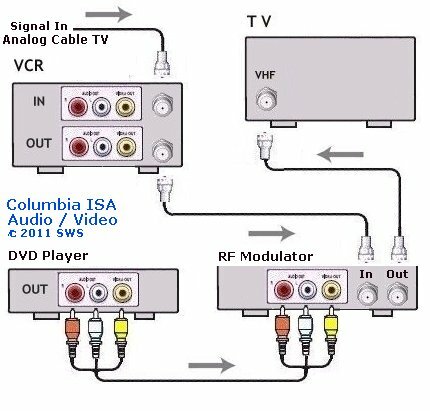 Using another 75 Ohm coaxial cable connect the “TO TV” terminal on the RF modulator to the cable or VHF/UHF input on your television set. Note: If your TV set does not have a VHF 75 Ohm connector, you will also need a 75 Ohm to 300 Ohm matching transformer, also called a balun. 6. Move the switch on the back of the RF Modulator to the channel (3 or 4) you want to use for the A/V signal. 8. Turn off A/V equipment to view antenna/cable programs. 9. Change the “ohms” switch on the RF Modulator to the position that gives you the best picture quality, typically 75 ohms. The unit will enable any VHF television set to receive signals from all A/V video equipment such as DVD players, video game systems, satellite receivers, camcorders and more. The RF Signal Modulator converts the separate Audio and Video input signals into standard VHF signals for television. Most boxes have a built-in automatically switched antenna/cable input. Hookup Diagram showing input components and TV with single RF input jack. Select channel 3 (or 4) on the TV. 1. Disconnect your current RF Cable connection from your Television's VHF coaxial input jack. 3. Plug Audio/Video Connections (Yellow, Red, White) to the AV Outputs of the DVD Player. 4. Connect the other end of the Audio/Video cables from DVD player to RF Modulator's yellow, white, red input jacks. RF Modulator TV/Cable RF Output jack with coaxial RF cable and then the other end to TV RF TV/Cable VHF coaxial Input jack. Plug in the RF Modulator's Power Cable. Select either the channel 3 or 4 output on the back of the RF modulator. Insert DVD into DVD player. PLAY. Tune TV to Channel 3 or 4 - Must match RF modulator channel output selection. Turn the TV on, and the RF modulator will automatically detect your cable input for the TV. When you want to watch your DVD player, just put the TV on channel 3 or 4, turn the DVD on, and the RF modulator will automatically detect the DVD player and will display your movie. When you turn the DVD Player off, the RF modulator will automatically return to normal TV viewing. If you have an older Television that only has a cable/antenna connection, you will need an RF Modulator in order to connect a DVD player or DVD recorder to the Television. The function of an RF modulator is simple. The RF modulator converts the video (and audio) output of a DVD player (or camcorder or video game) into a channel 3/4 signal that is compatible with a TV's cable or antenna input. There are many RF modulators available, but all function in a similar fashion. First: Plug your Cable TV/VCR output into the Cable input connection of the RF modulator and the DVD player into the RF modulator's A/V (Red, White, and Yellow OR Red, White, and S-Video) inputs. Second: Connect a standard RF cable from the RF modulator to your TV. Fourth: Turn the TV on and the RF modulator will automatically detect your cable input for the TV. When you want to watch your DVD player, just put the TV on channel 3 or 4, turn the DVD player on and the RF modulator will automatically detect the DVD player and will display your movie. When you turn the DVD player off, the RF Modulator should revert back to normal TV viewing. 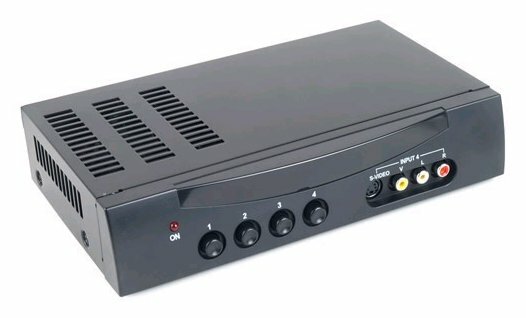 Almost all VCRs (video cassette recorder) have a built-in RF modulator so any VCR can also act as a RF modulator for a single RCA style input device. The problem with using a VCR as a RF modulator is the fact that most VCRs also have a built-in AGC (automatic gain control) circuit which may cause video distortions if connecting a DVD player. A camcorder or video game or satellite receiver should work. But you will have to have the VCR powered on all the time while viewing the TV. Select the line input on the VCR and tune the TV to channel 3 (or 4). 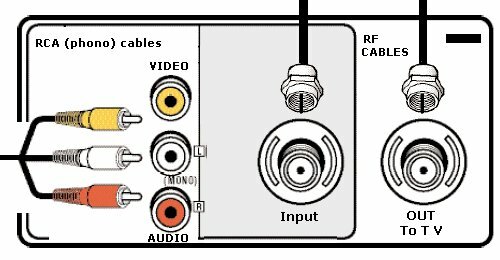 The three RCA cables, yellow video, white audio and red audio connect to the Modulator inputs and the coaxial cable (RG-6) connects to the TV OUT jack, usually a round silver threaded jack. The RCA cables can be from a DVD player, VCR, game console (PS3 or Xbox or Wii) or other device. The coaxial cable connects to the TV with only a RF/VHF input jack (round silver threaded). You do not need to have a coaxial cable connected to the Modulator's RF input jack if you are not using a TV antenna or other input. Tune cable TV channels using the VCR. Set TV on channel 3 (or 4).